SMSF Mortgage and SMSF Loans - What you need to know! SMSF residential loan LVR65% variable P&I. Boutique Australian Lender. Purchase or refinance. Warning: Comparison rate is true only for the example given and may not include all fees and charges. Different terms, fees and other loan amounts will result in a different comparison rate. Subject to lender’s credit approval. As of 2-Oct-2018, all big four lenders, CBA, ANZ, Westpac and NAB have all pulled out of the SMSF lending space. I believe it is the result of the royal commission where there were instances where investors bought poor performing properties and had to take a loss on the the Net Asset Value within their SMSF. This is something the regulators and government do not want. As such, all major lenders have pulled out of the space but will continue to support their existing SMSF mortgage and SMSF loan clients. Considering that property is one of the largest asset classes held in superannuation funds, it makes sense that more people are looking to purchase property within their SMSF. What type of property can be bought within a SMSF? Commercial – different types of properties including commercial, retail and light industrial are common to be held within the SMSF. Rural – rural residential investment properties can be held by it is more difficult as lenders are shying away from rural properties in general. What do you need to be aware of if you are thinking of purchasing property via an SMSF? The costs of not getting the correct advice can be disastrous as the penalties imposed by the ATO for non-compliance can be huge. All lenders want very specific documentation and hold structures to hold the property for the SMSF. If you do it incorrectly, the lender will not lend money against the property. Set up the correct trust structures and trustee structures to comply with Superannuation law. What are the specific SMSF loan / SMSF mortgage features? The self managed super fund property loan must be limited recourse lending. This means that if the SMSF fails to meet its obligations to make payments for the loan, the bank’s right to recovery in the event of default is limited to the property and not any other assets in the SMSF. However, the bank will also require personal guarantees from the beneficiaries (members) of the SMSF. This means that the other SMSF assets (i.e. everything except the property in question) are ringfenced but the beneficiaries assets external to the SMSF are indirectly (by way of personal guarantees) are at risk. The maximum Loan to Value of the SMSF loan will be lower than conventional. Typically, the maximum LVR for residential SMSF loans are at 72% and the maximum LVR for commercial SMSF loans are 64%. Serviceability is from all contributions to the SMSF which include the Employer Superannuation Guarantee payments and rental income. There is a large difference in the set up costs of purchasing property via an SMSF versus buying property external to an SMSF. 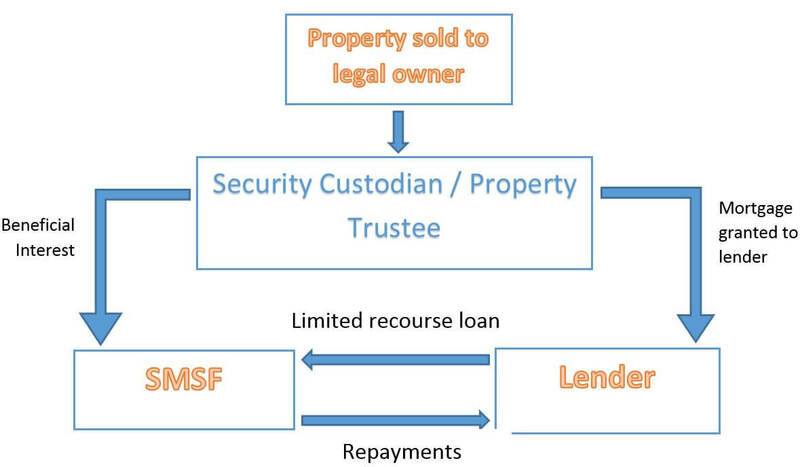 Considering most traditional lenders charge a minimal application fee (less than a couple hundred dollars), self managed super fund property loans can have fees up to $5,000 largely due to legal fees in confirming the SMSF trust deed and property custodian/property trust have the correct holding structure and authority to purchase property. Disclaimer: Still subject to lenders assessment and criteria. This is as good of an estimate we can put online.